You may have seen this on YouTube (over 1,000,000 have). If not, it's worth the time. You may need to have a box of tissues handy. The reality is that this is true for our church as well. Your investments aren't in buildings and props and "stuff" but in people. Oh God, let us be faithful. 9 - Hang Ten: Liar, Liar, Pants on Fire! It's just a little white lie, right? Apparently not. Studies show that most people lie at least once in a ten minute conversation. We justify it and rationalize it, but it's still sin. I remember when I was in school and had research papers due, I was like most guys and waited until the last minute to put them together. I also remember that when the pressure was on and the paper was due, I often would find myself wasting a lot of time. I would be distracted by the music on the radio (OK, I should have turned the radio off) or the things happening outside my window, or any number of things. Eventually, I would get the paper done, but it would always take longer than it should have. If I could have just focused better. Maybe I was suffering from some form of ADD. I think our church has a form of ADD (Attention Deficit Disorder.) I have my calendar before me, I see the purpose statement of the church on our website. I've preached about vision and moving forward. We've gone multi-site and have a simple format for personal Christian health, yet we seem to be moving so slowly. The Enemy knows that God's purposes, fulfilled through us, are dangerous for him. We all know that the Enemy attacks Christians and God's church. It's said he prowls like a lion looking for someone to devour. It's real. So, here we are running forward, on purpose as a church and "BOOM" another distraction comes. So, today it hit me. We're ADD. We, the church, just have a very hard time staying focused. It can be so frustrating. Our purpose, simply put is to glorify God. Focusing on distractions, even church business and "Christian issues" can keep us from fulfilling our purpose. The sense of urgency with my research papers would eventually get the best of me and I would get the work done. Maybe that's what we need as a church - the sense of urgency. Stay focused. Don't be distracted. Are the Jaguars Really Staying Put? Earlier this year Jacksonville Jaguars owner Wayne Weaver made a public statement about not having any intentions of selling the only major league professional team in the city. Now, it's been the fear of most fans that the Jags will eventually be playing in Los Angeles. I'm a Jags fan and I would hate for them to leave. Weaver makes his statement that seems to ensure the team is here for a while longer. Then, I found this article on Yahoo! Sports this morning ranking the worst NFL team owners. Our own Jaguars are listed as worst in the league. 32. Jacksonville Jaguars – Wayne Weaver: It was bad enough when moaned his way into hosting a Super Bowl, citing the need to help to finance renovations to a stadium in which he would later cover up nearly 10,000 seats to give the team a prayer of selling out on Sundays. What truly irks me, however, is Weaver’s stubborn insistence that he’s not trying to sell the franchise – “The team is not for sale,” he said earlier this month, “and I cannot say it any more clearly than that” – when it is common knowledge among his peers that he has discussed such a transaction with at least three prospective buyers. “He’s a sick puppy,” one owner says of Weaver. “He’s totally and completely out for his bottom line, and the league’s best interest is not in his mind at all.” Echoed a second owner: “He’s been actively trying to sell for a year-and-a-half, and he’s totally checked out. He knows it won’t work in Jacksonville.” The only way I see Whine escaping the bottom of this list in the foreseeable future? Sell the team – and I cannot say it any more clearly than that. Makes me wonder if we'll have a team in five years. Last night, my wife and I previewed the new film from the makers of "Facing the Giants." I've shared about this movie before in this blog, but now I've seen it. It's called "Fireproof." It's the story of a strong-willed firefighter and his wife who have been married for seven years. Like many marriages the "seven year itch" sets in and their marriage begins to crumble. It's difficult watching the verbal abuse taking place at the beginning of the film, mostly because I have seen so many couples go through the exact same thing in real life. This film is strong. It has a great soundtrack (much like "Giants") and the production quality is very good. However, unlike Giants, this one is really not going to interest children. This film tackles a very real and difficult subject, yet does so very well. We are going to attempt to rent out a local theater on opening weekend (it's the opening weekend numbers that determine how long a movie stays in a theater). I am hoping that every married, engaged, and separated couple attends this film showing (as well as every firefighter.) While real life may not wrap up nicely as a film does, the truth of the film and the "love dare" presented can literally change a marriage. Plan on attending the film showing with us, and if you can buy extra tickets and bring some friends. 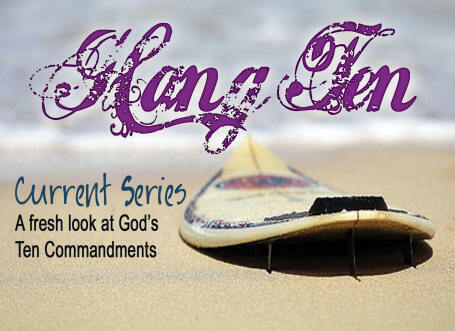 8 - Hang Ten: Grand Theft? Ought Not! OK, the title is supposed to be a play on "Grand Theft Auto" but it didn't work too well. Regardless, the 8th commandment is once again, one of those that seems pretty simple until you peel back the layers. 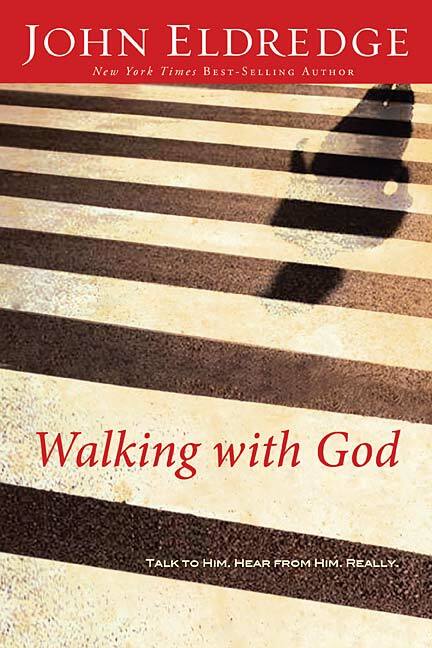 I began reading John Eldredge's newest book "Walking with God" today. Now, if this is anything like the latest books I've read, it will take me a few months to finish it. Seems I get to read a page or two every other day or so. Regardless, I've read all of Eldgredge's books (even Captivating) and was interested in the latest. I actually received a pre-release copies months before it hit bookstores in an online version, but it's hard for me to read a book on the computer screen. I like being able to hold the book in my hand, so I waited until I had the real thing. We end up with quite a list (of things to do to make our lives better). But the only lasting fruit it seems to bear is that it ties us up in knots. Am I supposed to be reading now, or exercising, or monitoring my fat intake, or creating a teachable moment for my son? The good news is you can't figure out life like that. You can't possibly master enough principles and disciplines to ensure that your life works out. You weren't meant to, and God won't let you. For he knows that if we succeed without him, we will be infinitely further from him. We will come to believe terrible things about the universe - things like I can make it on my own and If only I try harder, I can succeed. That whole approach to life - trying to figure it out, beat the odds, get on top of your game - it is utterly godless. Meaning, entirely without God. He is nowhere in those considerations. That sort of scrambling smacks more of the infamous folks who raised the tower of Babel than it does of those who walked with God in the garden in the cool of the day. In the end, I'd much rather have God. Wow! This is so true. I know these things. I knew them before. As is the case often, I needed a reminder. God is sovereign and so good. I'm looking forward to the rest of the book. If you've read this book, share some thoughts. If you haven't, you can get a copy through my online store. Click on the link to the left. I messed up and uploaded the wrong file last week, so now they're out of order, but here's the sermon focusing on Commandment 6 - You shall not murder. Looks like when I uploaded the sermon titled "Deadly Force" I messed up. I didn't upload the audio file, so it never made it to iTunes or here as a downloadable sermon. I'll fix this tomorrow. Sorry.